The Sun and Cloth Diapers- An Amazing Pair! The sun is awesome. It’s warm and bright and gives us much needed Vitamin D. It’s also awesome for cloth diapers! I didn’t use the sun for my diapers for the first year that I cloth diapered and now I couldn’t do without it!! 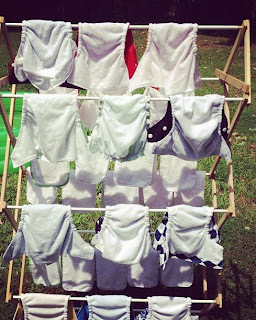 Here are a few things the sun can do for you and your cloth diapers! The sun removes stains! If you’ve been cloth diapering for even a short amount of time you’ve probably encountered a stain or two. They are pretty inevitable when cloth diapering. I’ve had them from exclusive breastfed poop stains to solid poop stains. Nobody likes stains, especially on pretty cloth diapers. So what do you do? Stick them in the sun! If you stick your stained diapers or inserts in the sun, slightly damp, the stains will disappear! I was so surprised the first time I did it! I had quite a few stained inserts and every single insert was stain free after I left them in the sun for a few hours! It’s like magic! The sun disinfects! Not only does the sun remove stains but it kills germs too! So whatever the washing machine doesn’t get, the sun will definitely get! Got stink issues? Try the sun for a while? It might help! The sun saves time and energy! For the longest time I just stuck my cloth diapers in the dryer. But when I tried the sun for my stains I realized that they dried really quickly in the sun! Over the summer I could have completely dry diapers and inserts within an hour when they dried outside in the sun and not use any electricity from my dryer! If you line dry your diapers outside in the sun you will save time, and use a lot less energy, ultimately saving you more money! The sun is an all natural and amazing way to keep your diapers performing at their best! It can also save so much time and money! Even if you don’t have a clothes line or a lot of sunshine, you can still stick your diapers near a window that gets a lot of sunshine and enjoy the benefits of the sun! So what are you waiting for?! Give the amazing sun a try! Michelle is a stay-at-home-mom to two boys, ages 3 and 10 months. She loves to blog about her life as a mom, cloth diapering, breastfeeding, babywearing, and other great parenting topics! Check her out over at The Not-So-Secret Confessions of a Second Time Mom.